Chronic pharyngitis is long-term inflammation and irritation of the pharynx – it’s also known as a persistent sore throat. Pharyngitis is one of the most common health complaints in the UK, yet its cause can be multifactorial. It can feel like scratchiness in the throat and there can be difficulty swallowing. In a recent study, researchers looked at the connection between chronic pharyngitis patients and high concentrations of salivary pepsin. Pepsin, which originates from the Greek word for digestion, is the stomach enzyme responsible for the digestion of protein. Because pepsin is only produced in the stomach, if it is found in the oesophagus, the throat, the mouth or the lungs – then it has been refluxed. A single high pepsin concentration will have the potential to damage the throat and cause inflammation. If repeated over periods of time, it may lead to chronic pharyngitis. Thirty-two patients presenting with typical chronic pharyngitis symptoms and laryngoscopy findings indicating the condition were recruited from the ENT outpatient clinic at Jinling Hospital and BenQ Hospital of Nanjing Medical University. Patients provided saliva samples which were collected into tubes and the pepsin concentration was determined using Peptest. Of the pharyngitis patients, 25 (78 per cent) were found to have a positive pepsin concentration and 7 (22 per cent) were negative. Of the 32 patients diagnosed with chronic pharyngitis 41 of 96 (43 per cent) saliva samples had a pepsin concentration above 75 ng/ml. These findings show that Peptest is a useful diagnostic tool for determining the presence of pepsin in chronic pharyngitis patients and that the condition is strongly associated with reflux – patients should be identified and treated for reflux. 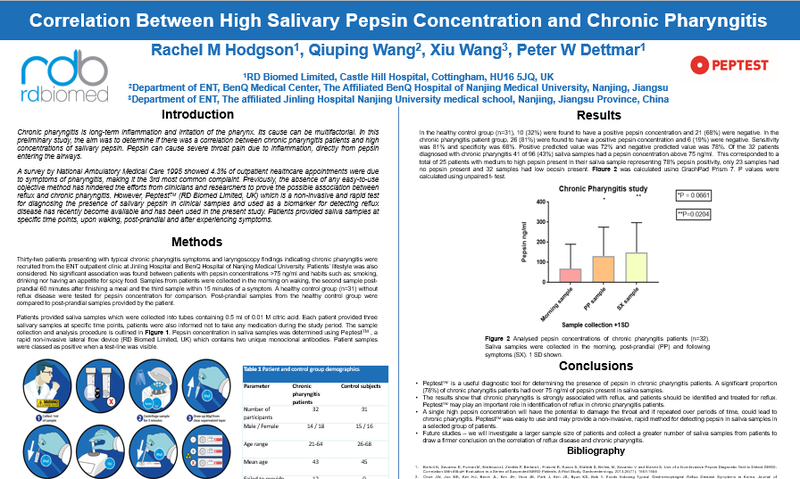 A poster for the Correlation between high salivary pepsin concentration and chronic pharyngitis study was presented at the 28th European Respiratory Society (ERS) International Congress in Paris.